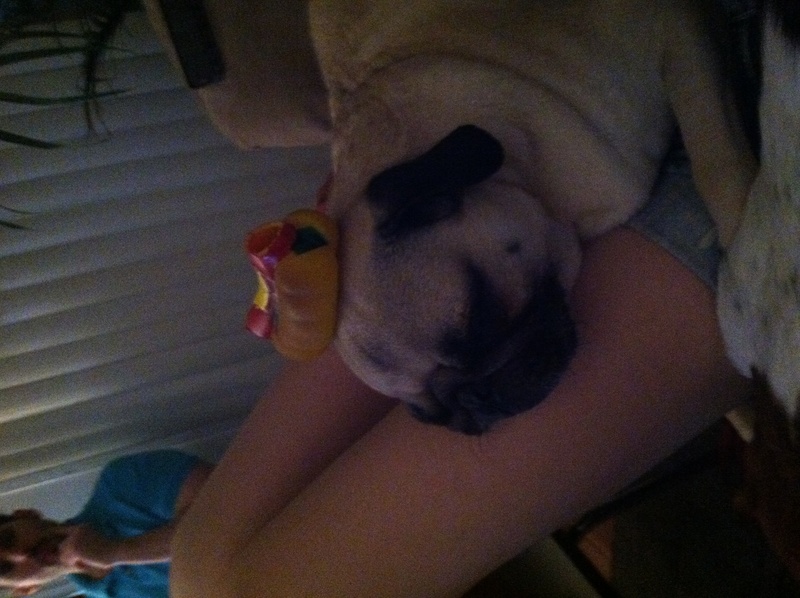 Yes, that is a pug with a toy hot dog on his head. This past weekend, I took a quick trip down to Washington, DC. I took the Megabus, which I will never do to DC again. For some reason their 8:30am bus did not arrive, so for the following hours of buses, they just tried to squeeze people on. It was total chaos. No one knew what was going on or which bus to get on. I ended up finally being loaded onto a bus at 10:30 am (a delay of an hour). Also, arriving at Union Station is not really convenient to where my friends are located in MD. Despite the delay getting into town, I had a lovely little trip. Riding the DC metro from the center of the city all the way out to the end of the Red Line, Shady Grove, was quite an adventure. They have cellphone service! The people all looked like normal commuters. Very strange. That evening, my friends had a late Easter party complete with deviled eggs, ham, and potato salad. The weather was beautiful for a party, sunny and warm. The weather did not hold for Sunday. It was rainy and miserable. 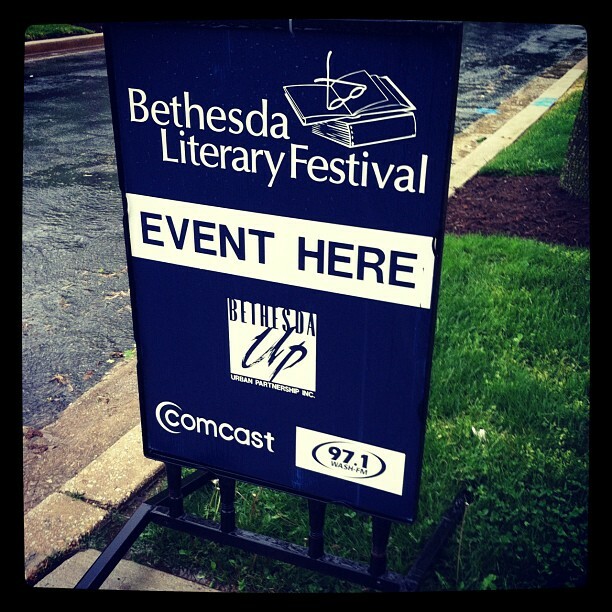 Despite that set back, Teresa and I headed to the Bethesda Literary Festival to check out a panel on the past and future of literary reviews. The panel was actually quite informative as the landscape of literary reviews is changing with the changes in print media (such as newspapers and magazines). I also learned that there is a large difference between literary reviews in the US and England. In England, they are unabashedly biased and will say, “yes, I am trashing his book because he spoke ill of mine.” However, in the US, there is more much restraint. Many will not even publish negative reviews. I took two big lessons away from the talk. First, I was inspired to start reviewing again on this blog. It really does help direct readers and is a good writing exercise. Secondly, the role of the publicist is crucial in getting a book reviewed. Many come from recommendations, they find it creepy if an author contacts them directly for a review. Afterwards, we went to grab lunch at the American Tap Room. 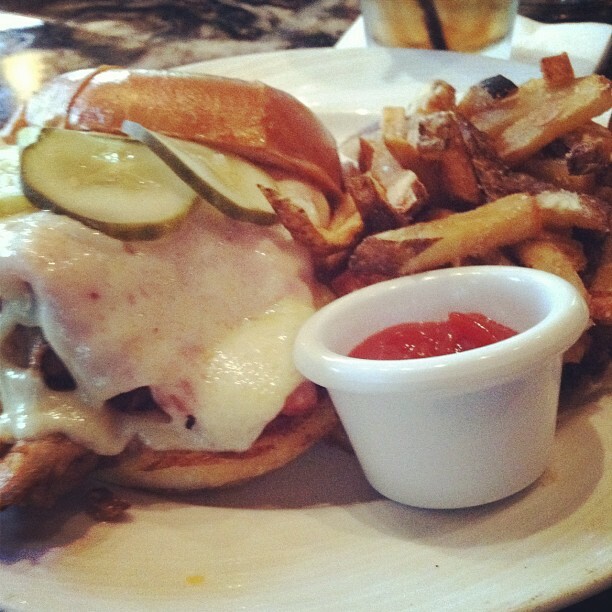 It is sort of hard to tell what that sandwich is, but it is a Southern Cubano Sandwich with pulled pork instead of ham. It was great. I think I ate ham all weekend basically between that and the Easter party leftovers. The fries were crispy and salty. The next stop on our journey through Bethesda was the Mustard Seed, a vintage and consignment store. I found two really cute dresses for summer and a nice scarf to wear. I’m excited for shopping in New York next week that helped get me warmed up. All too soon, I was back on the bus to New York. I love this city, but it was nice to get away for the weekend and spend time with old, dear friends.